Bharat is certainly is among the most awaited movies of 2019 and it is releasing this Eid with Katrina Kaif playing the lead role with Salman Khan. The film directed by Ali Abbas Zafar is certainly garnering a good buzz in the media. The director has worked in three different films with the actor and is back once again with another that is likely to do well at the box office. 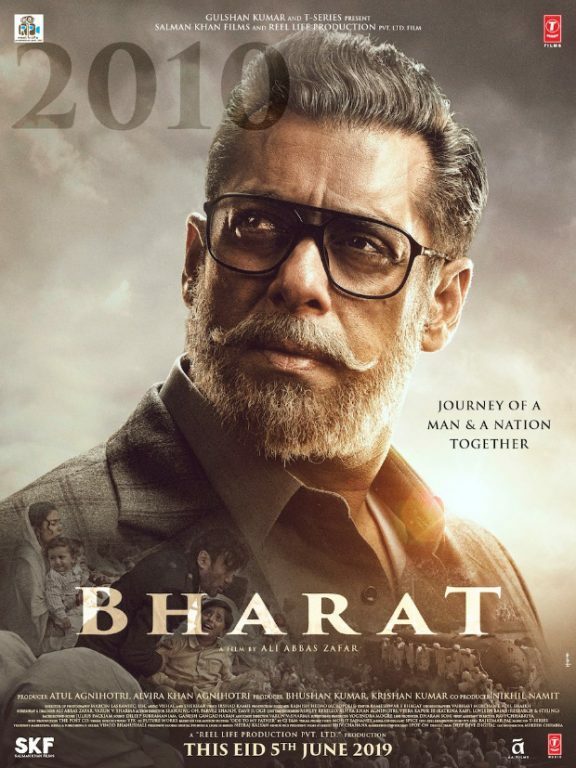 The makers have released Salman Khan’s new poster wherein we see the actor in an old man. In the film, Salman Khan has portrayed different roles right from the young man to the older one giving different looks right from the forties to the recent one in 2018. As you check the actor in the old man’s look, you find him with the specs and having the beard with the moustache. This is the first look poster of the film as the makers are yet to release anything except the teaser in the media. Well, the makers decide the release date of the trailer, it is obvious to see them creating the buzz for it. The poster release is the start of making the buzz of the film in the media. Salman in the film has around five different looks to portray by covering the time span of six decades including the late twenties and the late seventies. The trailer releases on 24th April, while the film releases in the eve of Eid. The film also has Tabu, Disha Patani, Sunil Grover and Jackie Shroff. One can expect some good actions in the film. It is directed by Ali Abbas Zafar, while it is produced by Atul Agnihotri’s own banner called Reel Life Production Pvt. Ltd.